[On Typhoid Fever] How often have I seen in past days, in the single narrow chamber of the day-labourer’s cottage, the father in the coffin, the mother in the sick-bed in muttering delirium, and nothing to relieve the desolation of the children but the devotion of some poor neighbour, who in too many cases paid the penalty of her kindness in becoming herself the victim of the same disorder. As quoted by John Tyndall in Lecture (19 Oct 1876) to Glasgow Science Lectures Association. Printed in 'Address Delivered Before The British Association Assembled at Belfast', The Fortnightly Review (1 Nov 1876), 26 N.S., No. 119, 572. Laws alone can not secure freedom of expression; in order that every man present his views without penalty there must be spirit of tolerance in the entire population. No doubt, a scientist isn’t necessarily penalized for being a complex, versatile, eccentric individual with lots of extra-scientific interests. But it certainly doesn't help him a bit. 'The Historical Background to the Anti-Science Movement'. In Gordon Ethelbert Ward Wolstenholme, Civilization & Science in Conflict or Collaboration? (1972), 29. Only go on working so long as the brain is quite clear. 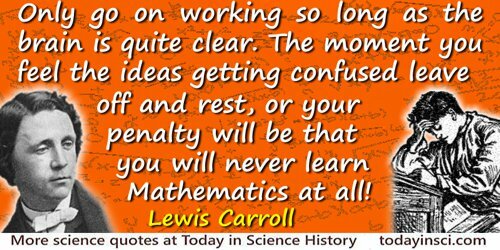 The moment you feel the ideas getting confused leave off and rest, or your penalty will be that you will never learn Mathematics at all! From letter to Edith Rix with hints for studying (about Mar 1885), in Stuart Dodgson Collingwood, The Life and Letters of Lewis Carroll (1898), 241. [The teaching of Nature] is harsh and wasteful in its operation. Ignorance is visited as sharply as wilful disobedience—incapacity meets with the same punishment as crime. Nature’s discipline is not even a word and a blow, and the blow first; but the blow without the word. It is left to you to find out why your ears are boxed. The object of what we commonly call education—that education in which man intervenes, and which I shall distinguish as artificial education—is to make good these defects in Nature’s methods; to prepare the child to receive Nature’s education, neither incapably, nor ignorantly, nor with wilful disobedience; and to understand the preliminary symptoms of her displeasure, without waiting for the box on the ear. In short, all artificial education ought to he an anticipation of natural education. And a liberal education is an artificial education, which has not only prepared a man to escape the great evils of disobedience to natural laws, but has trained him to appreciate and to seize upon the rewards, which Nature scatters with as free a hand as her penalties. From Inaugural Address as Principal, South London Working Men’s College, in 'A Liberal Education; and Where to Find it', Macmillan's Magazine (Mar 1868), 17, 370.